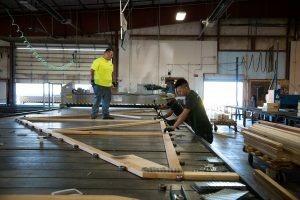 Alpine Lumber’s Truss Division in Commerce City prides itself with innovative, outside the box design, and state of the art fabrication. Our pre-engineered roof and floor trusses are designed, scheduled, fabricated and delivered just in time to help keep our customers’ sites uncluttered and projects running smoothly. Our employee owners take pride in paying close attention to the details, from optimizing our designs to our On-Time, In-Full delivery to the jobsites. We continually strive to improve upon every aspect of our processes to provide the best set of trusses in the industry. *Store hours may vary due to inventory and holidays. Please call ahead to verify.